How can we rely on stl function on some data when it shows seasonal variation. Does this seasonal variation need to be seen in view of some other parameters? Thanks for your insight. The code has been taken from this page: Is this an appropriate method to test for seasonal effects in suicide count data? Loess decomposition is intended to smooth the series by applying averages to the data so that it collapses into components, e.g. the trend or seasonal, that are interesting for the analysis of the data. But this methodology is not intended to do a formal test for the presence of seasonality. 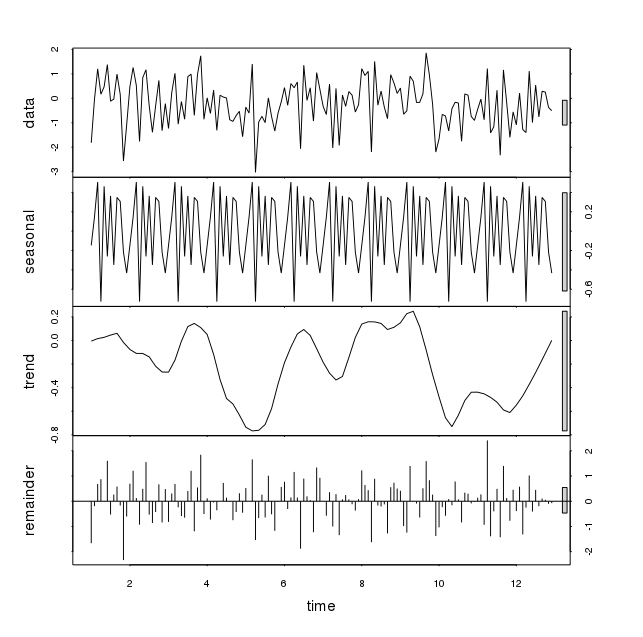 Although in your example stl returns a smoothed pattern of seasonal periodicity, this pattern is not relevant to explain the dynamics of the series. In order to see that, we can compare the variance of each component with respect to the variance of the original series. We can see that it is the remainder what explains most of the variance in the data (as we would expect for a white noise process). If we take a series with seasonality, the relative variance of the seasonal component is much more relevant (although we don't have a straightforward way to test it since loess is not parametric). The relative variances indicate that seasonality is the main component explaining the dynamics of the series. A careless look at the plot from stl can be deceptive. The nice pattern returned by stl may make us think that a relevant seasonal pattern can be identified in the data, but a closer look may reveal that it's not actually the case. 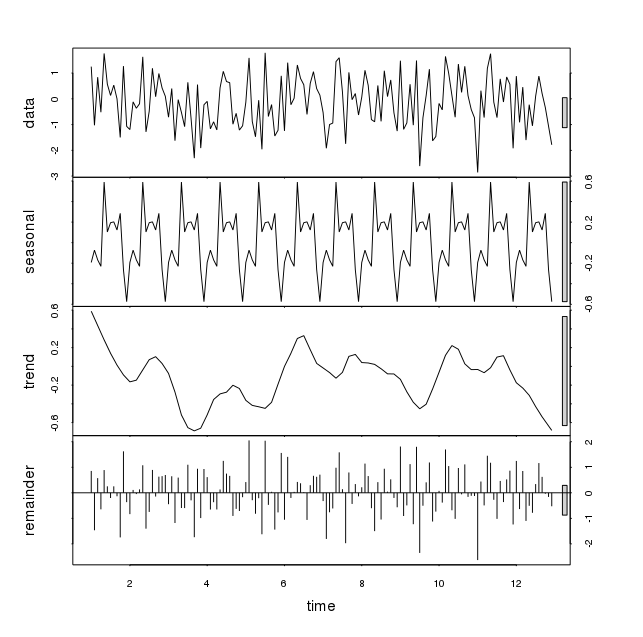 If the purpose is to decide on the presence of seasonality, loess decomposition can be useful as a preliminary view but it should be complemented with other tools. In a similar vein I have seen the utilization of Fourier Models to non-seasonal data , forcing a seasonal structure into the fit and forecast values, causing a similar (gasp !) result. Fitting a presumed model gives the user what he is imposing/presuming which is not always what good analytics would suggest/deliver. Not the answer you're looking for? Browse other questions tagged time-series seasonality loess or ask your own question. STL decomposition: how to choose the amount of smoothing in trend post-smoothing?